I began my career in 1982 at the Naval Aviation Depot at Cherry Point, NC, working as a structural engineer supporting the H-46 helicopter program. In 1984 I began working on the V-22 Osprey program (that's one behind me in the picture), developing structural repair designs for the composite structures of the aircraft. 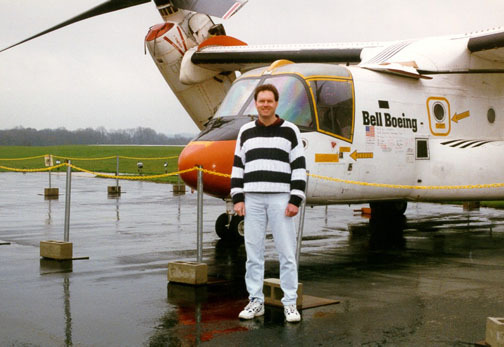 In 1993 I had the unique opportunity to move to the Boeing Helicopter Company as a government member of the team that designed the production version of the Osprey, remaining there until 1998. I am currently working for the Naval Air Systems Command in Patuxent River, MD, in the Program Office for the F/A-18 Hornet fighter jet. There, I am a Systems Engineer responsible for engineering oversight of the Hornet's structural and mechanical systems. My love for the space program began in the second grade, when I saw photos of the Apollo 7 splashdown in the newspaper. I avidly watched and followed all the Apollo flights, and have read as much as I could on the subject since then. I live in Waldorf, MD and my hobbies include reading, flying (though I admit my medical certification has lapsed) and scuba diving.